Testing for the presence of alterations in MYC, TP53, NRAS, and BCL6 is relevant for immunodeficiency-associated lymphomas. Of these, probably the most important and feasible in a clinical molecular laboratory on a routine basis is the detection of MYC translocation using fluorescence (FISH) or chromogenic (CISH) in situ hybridization assays. MYC probe method is detection of variant translocations of MYC and the IGLK or IGLL genes. CISH is very similar to FISH, except the probes are labeled with two different chromogenic substrates, so their evaluation does not require a fluorescent microscope and the slides provide a permanent record of the assay. While somewhat less sensitive than FISH, commercial CISH probes to detect the MYC-IGH translocation are available, and are being used successfully in clinical laboratories. CISH may soon become standard of care for diagnosis of BL or atypical BL when histologic features are suggestive of this disease. SBA can be used to document translocations involving the MYC and BCL6 genes, but as mentioned above it is laborintensive and time-consuming, has long turnaround times, and requires fresh or frozen tissue. Thus, this technique is used primarily for research applications. 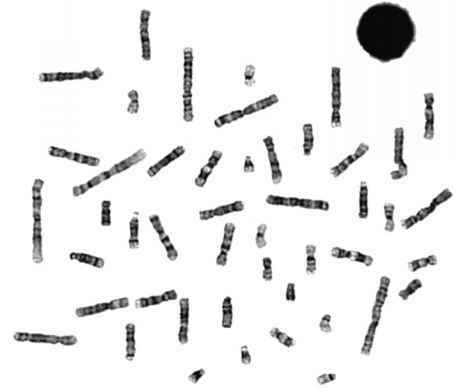 A comparison of CISH and Southern blot for the MYC-IGH translocation is shown in Figure 34-3. (b) Southern blot analysis using a MYC probe in four cases of AIDS-related lymphoma. Cases 1 and 2 show a single band, corresponding to the germline configuration, and cases 3 and 4 have a MYC translocation, as indicated by a smaller second band. DNA was digested with Hind III,and after electrophoresis and transfer, was hybridized to a radiolabeled probe corresponding to the third exon of the MYC gene. Single-strand conformation polymorphism analysis (SSCP) is a useful assay to screen for point mutations of RAS and TP53, although it is not used routinely in clinical laboratories due to the complexity of the assay. The procedure should be carefully validated and the sensitivity of the assay determined to allow for adequate interpretation of results. PTLD are unlikely to be identifiable by sequencing. An alternative approach that can be used in a mixed cell population is PCR followed by cloning into plasmid vectors and sequencing of multiple clones. A mutant allele will consistently show up in a proportion of the clones, while the normal allele from tumor cells and normal infiltrating cells will represent the remainder of the sequenced clones. Of note, because DNA polymerases used in the PCR are prone to errors, the identical alteration has to be present in multiple clones to be scored as positive.